I learned how to play mahjong while living in England. And now, more than five years later I’ve found a group of women who play mahjong here in Israel. 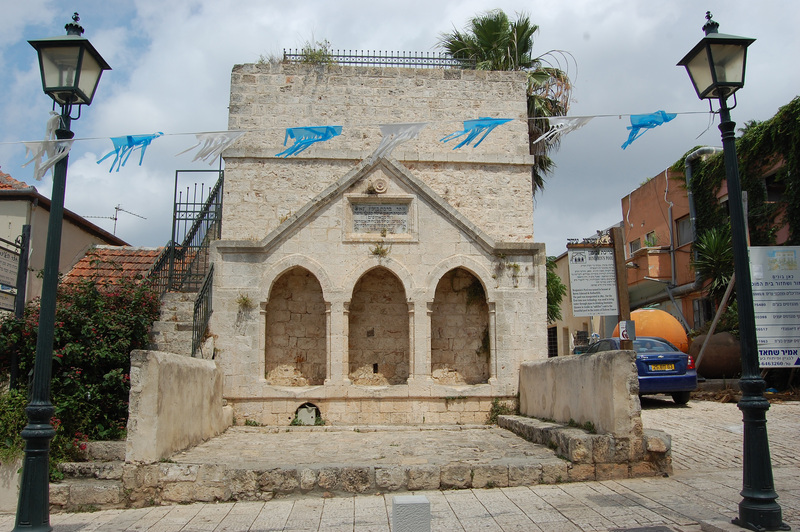 This group meets in Zichron Yaakov, about a 45-minute drive north from Herzliya. The group plays by different rules than I learned in England. There’ll be a period of adjustment for me as I get used to these new rules, demonstrated resoundingly by my very first hand. The tiles in my opening hand were perfect for a game in England, but here they amounted to zilch. Benjamin's Pool, built in 1891, to pipe water into the town so residents didn't have to carry water from the springs. After a couple of rounds of mahjong we went into the Zichron Yaakov town center for lunch. 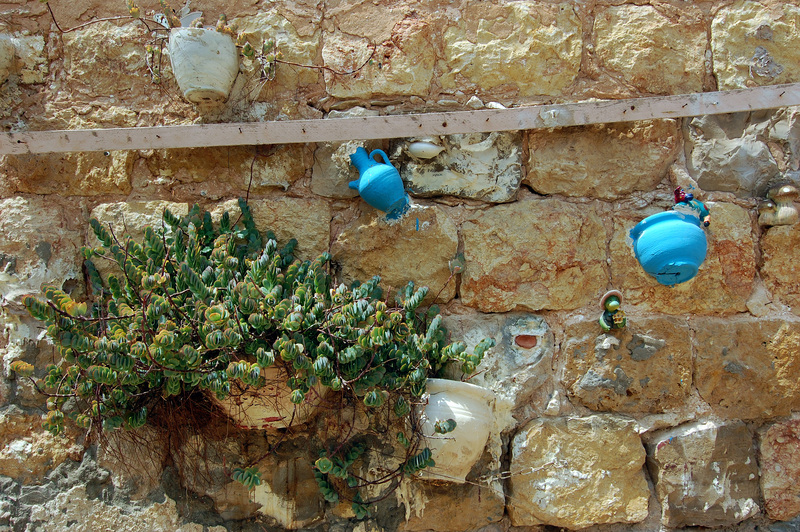 I was thoroughly charmed by Zichron Yaakov. It sits perched on a hill overlooking the Mediterranean. The town was founded in 1882 by Baron Edmond James de Rothschild and named in honor of his father, James (Jacob) Mayer de Rothschild. (Zichron Yaakov means Jacob’s memorial in Hebrew.) The Baron helped the settlers succeed in their agricultural endeavors. 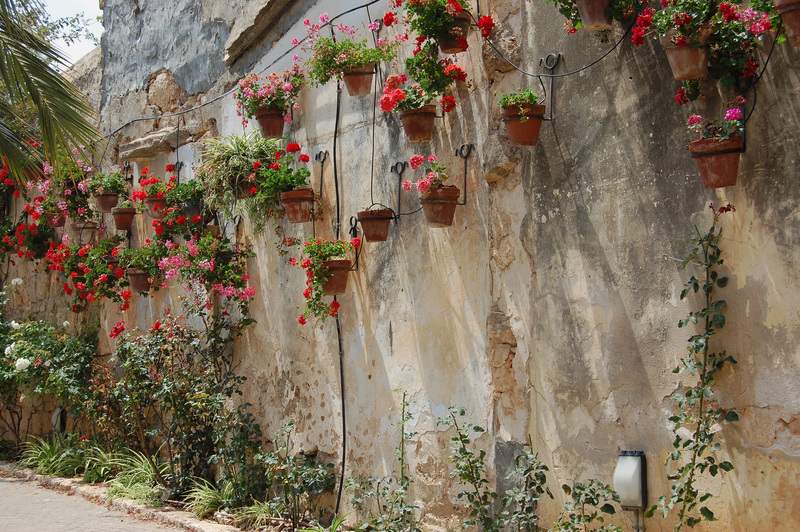 Two of Israel’s best wineries, Carmel and Tishbi, were founded in Zichron. These days the town center has a bohemian atmosphere, boasting boutiques selling crafts and jewelry, coffeehouses and restaurants all in a picturesque setting. We had lunch at one of the Tishbi winery restaurants. The menu is vegetarian and kosher. (I had a yummy couscous salad.) It was a lovely day and we sat outside enjoying our food but feeling sorry for the scrawny cats that wandered between the tables hoping for scraps of food to fall their way. One of my dining companions made sure some did. Inside the restaurant a wide array of Tishbi wines are for sale and I learned that if I brought an empty wine bottle I could get it filled with the house wine and corked for just 19 shekels ($5.50). Such a deal! We wandered through the town center for a bit after lunch and popped into a few of the stores. I was most impressed by Tutneyar, a shop selling handmade paper. A wide selection of beautiful handmade papers were on display and many had been fashioned into clever lampshades, booklets and other uses. They conduct papermaking demonstrations and I just may go back to participate in one. Indeed, there are many reasons to return to Zichron Yaakov. 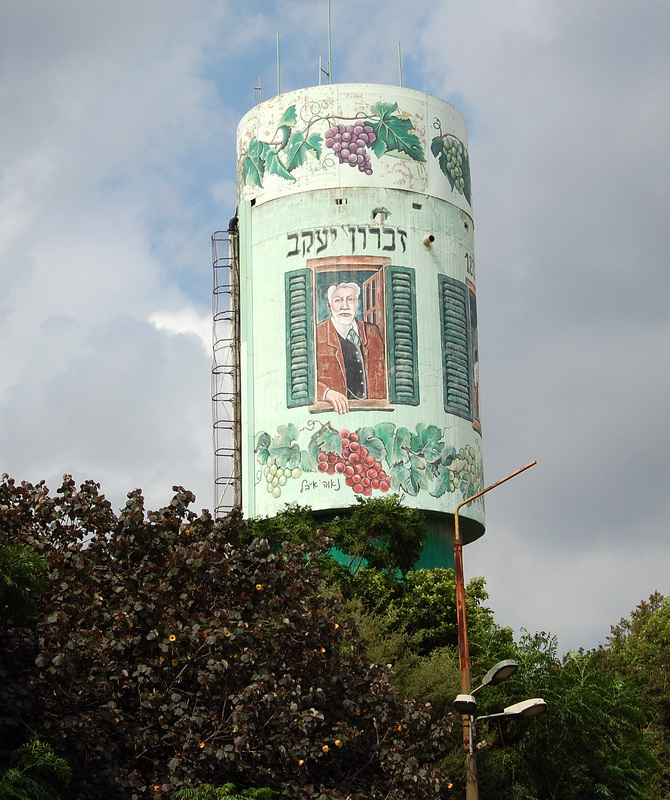 The Baron himself looms large on the Zichron Yaakov watertower.